Sunshine, clear blue skies and an army of smiling volunteers from the sailing club greeted the RS800 sailors as they arrived in Beer, Devon for round five of the 2018 RS800 Rooster National Tour. As if Beer isn’t already a fantastic venue, the club couldn’t have done more to make the visitors feel welcome. In preparation for the event, club volunteers had worked tirelessly on flattening as much of the beach as possible and laying an additional 200 metres of solid mat and decking to make it easier for everyone to move their boats around. The modifications to the beach access were a great success and despite the efforts of one grumpy fish delivery driver, soon all the boats were installed on the beach and ready to go. After the traditional sailors’ breakfast of bacon rolls and unlimited tea refills PRO Geoff Adkin gave a quick briefing on the beach and following a short postponement while the wind settled, the fleet headed out to the starting area in a light, but surprisingly steady SSWesterly breeze. The wind stayed fairly settled all afternoon at around 6-8 knots, clocking a few degrees right for a while, before swinging back. This enabled the very wise PRO to run four races instead of the planned three in anticipation of lighter winds and the possibility of no racing on Sunday. Relative newbie to the class, Tom Morris crewed by class veteran, Guy Filmore, quickly showed their second place at Stokes Bay was no one-off by winning the first race. However, for the rest of the afternoon it was the familiar sight of Team Gul, Luke and Emma McEwen, leading the pack home with bullets in the three remaining races. Further back the battle for ‘best of the rest’ was shaping up between Paul Jenkins in his latest boat, fresh from racing his Moth against the best sailors in the world, crewed by veteran super crew Nick Jerkins and Team Bartbusch, Peter Barton and (Team Allen sailor) Chris Feibusch inChalidaVijitvongthong with both teams on equal points overnight. Team ‘Whyte Bikes’ of Andy and Ally Jeffries, and Ralph Singleton, with rock star guest crew Rory ‘What’s the Story’ Hunter, were also still in the hunt at the end of day one. Once back ashore everyone enjoyed a fantastic meal laid on by the club washed down with lashings of local beer and much merriment and bar room chatter as the sun set over the club’s clifftop terrace. Sunday dawned hot and windless and many expected that to be that, enjoying sunbathing, swimming, paddle boarding and drinking tea, while the postponement flag hung limply from the club flagpole. However, a light, but steady thermal breeze was gradually building and by midday the competitors were released to go racing with PRO aiming to complete the series with the final two races before the 2pm cut off. Little by little the breeze built until there was almost some twin-wiring in the latter part of the second race. Peter Barton and Chris Feibusch took the lead in race five until a knotted kite halyard and subsequent trawl let Tom Morris and Guy Filmore through for another win. Peter and Chris hung on for second, with Luke and Emma third. The final race of the day, once again saw Peter and Chris take the lead having now sorted out their starting gremlins, but found themselves in a hole down the middle of the second downwind leg dropping them down to fifth. Predictably first to capitalise were Luke and Emma, who took the race win and the overall event win. Second once again, were Tom and Guy, whose form is building ominously leading up to the RS Games, giving them second overall. Completing the podium were Peter Barton and Chris Feibusch in their first event together this year. Thanks must go to everyone at Beer Sailing Club who laid on a superb event with warm welcomes, brilliant race management, fantastic food and of course, a spectacular setting. Special thanks to James Green, for making the weekend happen and encouraging the RS800s to come back to Beer. Thanks also to our circuit sponsors Rooster. 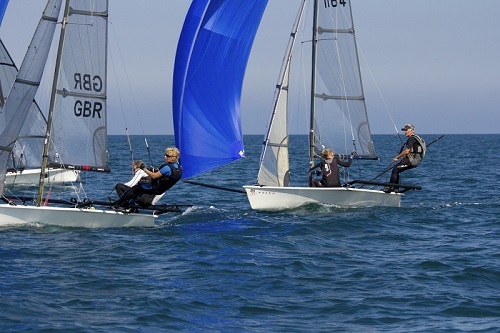 Next stop for the RS800s is the RS800 Nationals at the RS Games at Weymouth taking place at the Weymouth and Portland National Sailing Academy from 16th to 19th August followed by round six of the Rooster National Tour at Eastbourne Sovereign Sailing Club on 8th and 9th September.